I have always had difficulties relating to all things Far Eastern and the bamboo was no exception. It was planted by my neighbor, in a small space and its only room to grow is on my side if the fence. It’s not native. It doesn’t have flowers for for birds nor bees. Even the slugs won’t eat it. It doesn’t provide habitat and it grows very fast. 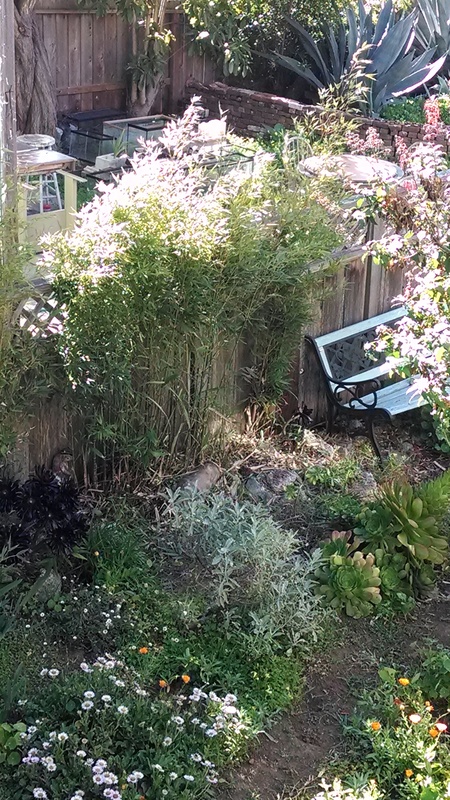 So for years I’ve had to battle the bamboo back and some years my hands were too sore that the beastly bower blossomed and grew. Today that all changed. I was in my garden cutting back the browning bulbs and I decided to have a hack at my oriental nemesis. The base if the bamboo is so thick and hard I can only cut a bit at a time. So, instead of trying to eliminate the weed at the root, I started trimming the worst of the worst, the little branches that stick out into the yard and shade over my other plants. Surprise is me! Once the bush was trimmed back it appeared to hug the fence, effectively making the fence taller and adding a sleek green element next to the bench. The bamboo has spoken, it has told me how it needs to be tended. I can say that I have learned to hear plants…in Cantonese.